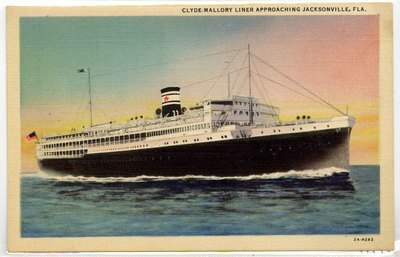 "Clyde-Mallory Liner Approaching Jacksonville, Fla. 1900-1920"
On the Back: The "Cherokee", "Seminole", "Mohawk", "Algonquin" are each 402 feet long; 54 feet beam; displacement when laden, 8,140 tons; freight capacity 252,500 cubic feet; passenger capacity; 446. The are driven by oil-burning turbines; their fuel oil tanks will hold 6,180 barrels affording a cruising radius of 7,000 miles. The shaft horsepower is 4,200 and the average speed is 16 knots per hour.